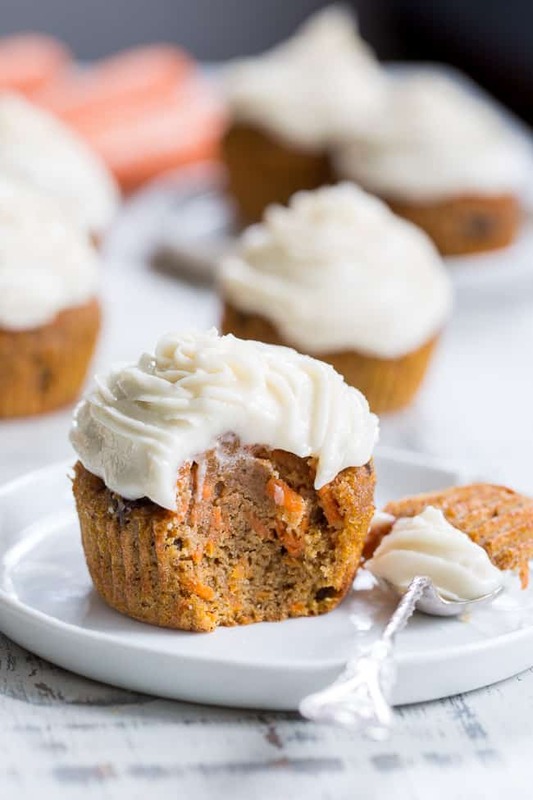 These dreamy carrot cake cupcakes are made with coconut and tapioca flour and sweetened with maple syrup, making them both paleo and nut free. They’re topped with a sweet creamy paleo vanilla “buttercream” that tastes just like real thing! Welcome to another dessert-y weekend! 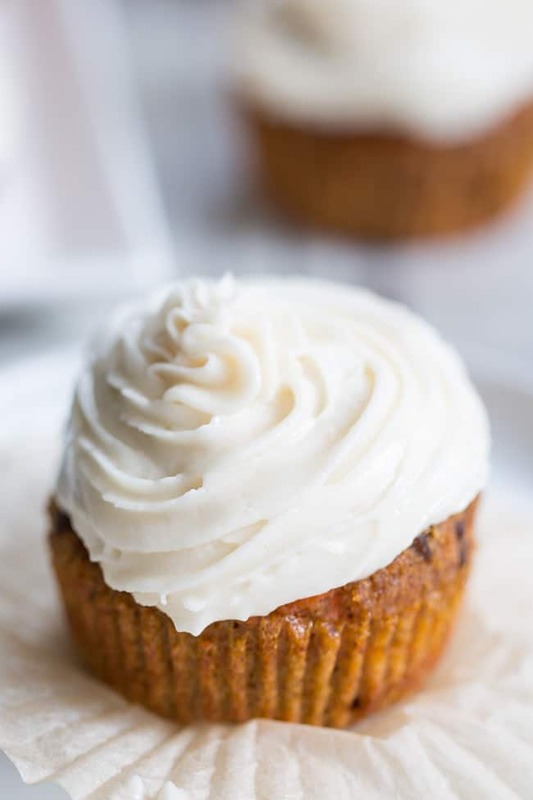 I have two nut-free + paleo baking recipes to share and here we are with the first – carrot cake cupcakes with “buttercream” frosting, just in time for Spring. Well, we might have a few weeks left until real spring, but in my mind, (and kitchen!) we’re there. 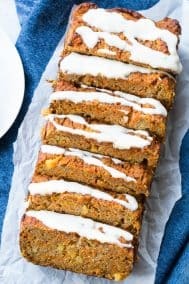 I realize that carrot cake is traditionally frosted with cream cheese frosting, but my paleo “cream cheese” frosting uses cashews, so that wouldn’t work to keep things nut free. 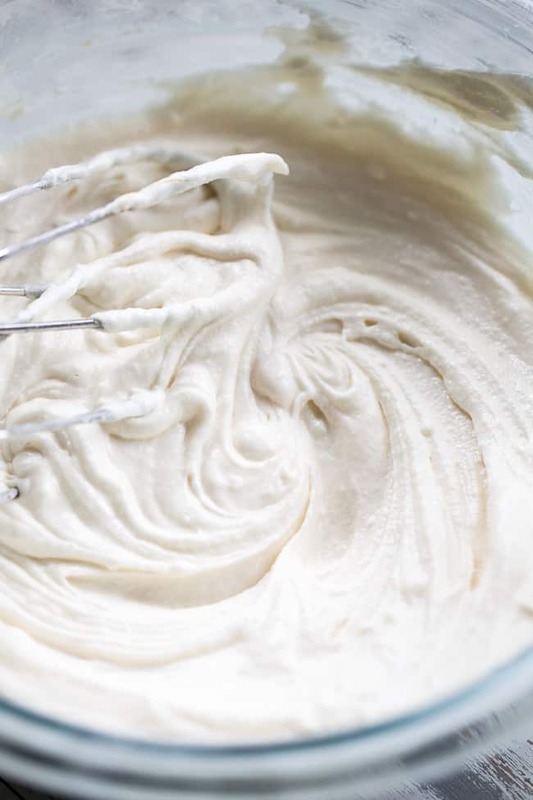 That said, if you don’t need to keep things nut free and want to try out my cashew coconut cream cheese frosting – I’ll link that recipe right here. Anyway, about the cupcakes. I decided to go with a mix of coconut and tapioca flour for these to get a great, traditional texture, and it did not fail me! It took just two tries to get the ratios right – which is not at all bad for experimenting with coconut flour. That said, you might be slightly horrified at how thick the “batter” is after mixing if you’re not familiar with baking with coconut flour – it really looks more like a dough. Since I did use baking powder, they’ll expand/rise a bit, but not all that much, so there’s no need to worry they’ll spill over and make a mess. The fake “buttercream” is a totally new recipe that I used for both these cupcakes and some traditional vanilla cupcakes that will be coming to the blog soon. Instead of butter, I whipped up a mixture of palm oil shortening (which you can find here) and refined coconut oil for great texture and neutral flavor. I added honey to sweeten, vanilla extract for flavor, and tapioca flour to thicken up the texture to resemble a real buttercream. 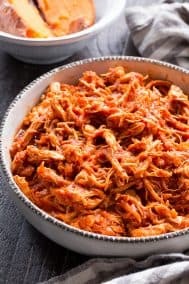 I will say that I was impressed that the texture remained soft but not runny at room temp, and though it hardens in the fridge, you can easily re-whip it back to its original form in no time at all. Easy! 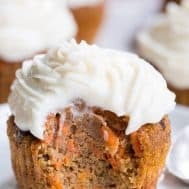 These carrot cake cupcakes are delicious enough to serve to anyone – paleo or not – and you’ll be amazed at how moist and tender (without being too moist) the texture is. I added raisins to mine, which is optional, and there’s room in the recipe to add very well drained crushed pineapple if you enjoy that flavor in your carrot cake. 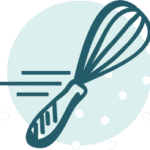 I hope you’re ready for a serious treat here – get your carrots grated and oven preheated – let’s bake! 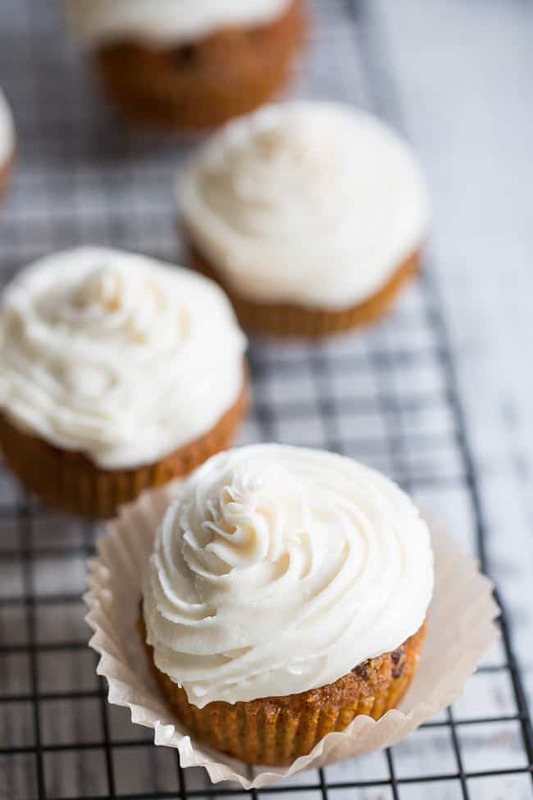 These dreamy carrot cake cupcakes are made with coconut and tapioca flour and sweetened with maple syrup, making them both paleo and nut free. They're topped with a sweet creamy paleo vanilla "buttercream" that tastes just like real thing! In one bowl, combine with coconut and tapioca flour, baking powder, baking soda, salt and spices, set aside. In a separate bowl, whisk together the eggs, coconut milk, coconut oil, maple syrup, lemon juice and vanilla until very smooth. Stir dry ingredients into wet mixture slowly until a very thick batter forms. Due to the coconut flour, batter will seem more like a dough. Stir in grated carrots and raisins, and pineapple if using. Scoop batter into muffin cups all the way up, to get them nice and round, you can actually roll them into balls loosely with your hands. I made 14 cupcakes, so you'll likely have to bake them in 2 batches. Bake in the preheated oven for 20 mins or until they rise and are set in the center. 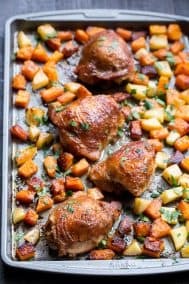 Remove from oven and allow to sit 5 minutes in the pan, then transfer to wire racks to cool completely. 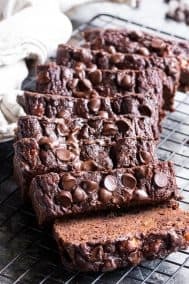 Want More Paleo and Nut Free Baking Recipes? Try One of These! I’m going to make these for my dad’s birthday. It’s his favorite. Can I sub anything for palm shortening? You can also use butter if that’ okay with you, I’m not sure how all coconut oil would turn out though! Any thoughts on lankanta maple syrup? Yay!! We are huge carrot cake fans. Looks delicious :). Do you think cupcake recipe could be doubled and would come out ok as a cake? Also, lard would probably be the best sub for palm oil, or have you tried butter? You can definitely use butter for the frosting, and yes I think you can use the recipe to make a cake! I was wondering the same two things: can I make this into a cake and can I use butter for the frosting? If I were to make this a double layer cake, how many times would you recommend I multiply this recipe? Thank you!! Yes you can, however I’m not sure about the amount you’d need for a cake. I’d say a double batch would definitely give you enough though! I love carrot cake and these cupcakes look so moist and delicious! 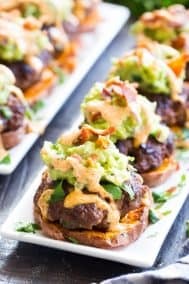 I made these today and they were amazing! Everyone loved them! Will be bringing them to easter! 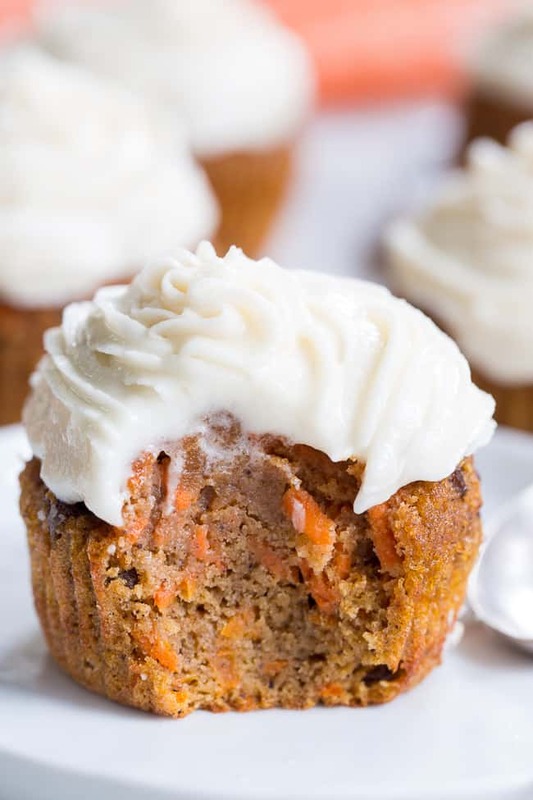 Holy cow – I love carrot cake and these look perfect! I’m totally adding these to the list of my birthday desserts I’ll be making for the rest of the month. I’m not huge on celebrating my birthday, but I still totally use it as an opportunity to try some fun desserts. Fun desserts are good no matter what the day! Enjoy! Vai depender do tamanho da tapioca e vai depender do recheio da tapioca. A quantidade de Farinha usada determina a quantidade de carboidratos:A farinha de tapioca é extraída da mandioca (aipim) que é um tubérculo, fonte de carboidratos, consequentemente, a farinha de tapioca também é uma fonte de carboidratos. Assim sendo, um dos fatores principais para verificar quantas gramas de carboidrato tem em uma tapioca é o tamanho dela, quanto maior, mais farinha é usada e mais carboidrato ela vai ter. Cada colher de sopa de tapioca tem aproximadamente 30g de tapioca, que contém 17g de tapioca. Considerando uma massa de tapioca feita com duas colheres de sopa, já teríamos 34g de carboidrato. Depois de considerada a quantidade de carboidrato na farinha de tapioca, devemos analisar o outro fator: o recheio. Quantas gramas de carboidrato tem no recheio da Tapioca? Se o primeiro fator era um tanto quanto subjetivo, dependendo do tamanho da tapioca, o fator recheio é ainda mais imprevisível. These are seriously amazing!!!! I’m in Love! I made some for my friend who is on a SIBO/Low FOD regimine and she is over the moon! Thank you! Your recipe sounds wonderful!! 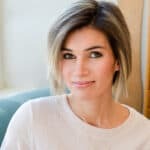 I have celiac and always looking for recipes. Are there any other flours that I could substitute for the tapioca flour? I have on hand, millet and quiona and rice flour. Would these work? Many thanks!!! I liked how these turned out. I had to cook them for slightly longer and I subbed butter for the palm shortening in the frosting. Also, because I wanted them to travel, I split off the today and put the frosting in the middle. These are fantastic! Is there a sub for Palm Oil? It just doesnt like me to much :o) The frosting tastes great though!! What’s the best way to thicken the frosting? Followed recipe and it is still very thin. Add more tapioca flour? I’m not sure why it’s so thin, but re-chilling it and then re-whipping it should help. These could not be improved-they are very moist and perfect in every way. Hi! The full fat coconut milk “blended before use”… that means to blend up the water that sits on the bottom of the can too, yeah? “blend before use” means to put everything in blender before? “blend before use” means to put everything in blender before? Also, will all vegetable shortening work? I was so excited to make these carrot cupcakes, which is crazy since I love chocolate. I don’t know what happened, but even after leaving the cupcakes for 10 mins longer in the oven they still didn’t cook through… and the frosting had to be put in the fridge to harden. I’m going to put them back in the oven for more time… I hope I can save them. So sorry, not sure what happened! Sounds like the batter was too wet for some reason, hopefully it works out alright. We made these muffins this weekend, and they were PERFECT. They were incredibly moist and the perfect texture not at all gummy texture like some Paleo baked goods can be. The flavor is just right – just the right sweetness, the spices were perfect. 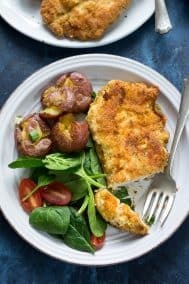 We will definitely make this recipe again! Hi! You’d definitely need a lot more almond flour, more than twice the amount I’m guessing, something like 1 3/4 – 2 cups? If you try it, let me know how it works out! Just made these! I haven’t tried the cupcake yet (I’m sure they are fabulous as everything I’ve made of yours has been) but the frosting is AMAZING! I have always been a big frosting person and have missed buttercream frosting!! Thank you! 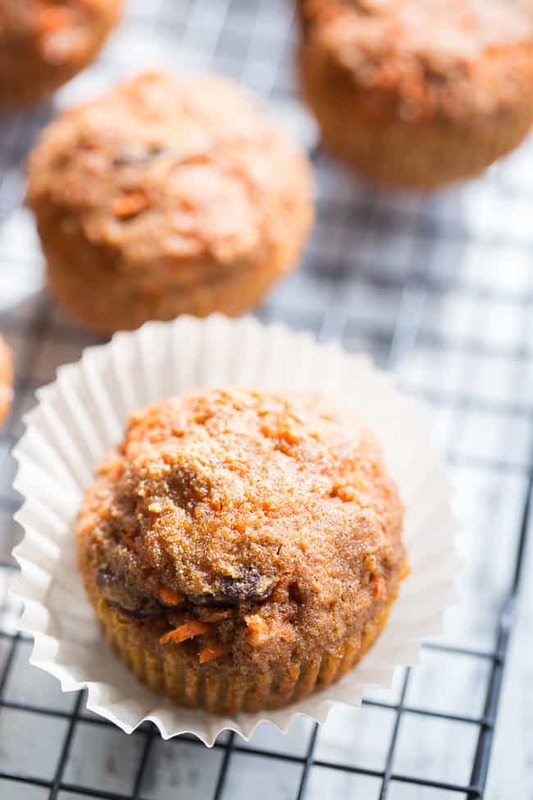 I had a go at making these fabulously looking muffins as carrot cakes are a favourite in our household. 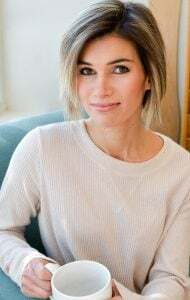 Since I have started introducing paleo cooking I have made loads of your amazing recipes. But this one the batter before adding the carrots and raisins were so runny and very thin so I started adding tapioca flour a table spoon at a time to get the batter to be thick. When I almost reached a good consistency I stopped but the result were still not as good I was hopping it would be. I wonder were it all went wrong. I made this recipe as an 8×8 cake and served it at a picnic with friends who eat gluten free or use all purpose flour. It was a big hit! It was moist, firm and the frosting was not too sweet. Will definitely make this again. I made this recipe as a 8×8 cake and took it to a potluck at the beach. It was a big hit! I would love to make these. Is there any way I can substitute eggs? My son has an egg allergy. Thank you! Oh my gosh!!! These are so yummy!! I love carrot cake and these are exactly what they say they are! Delicious!! 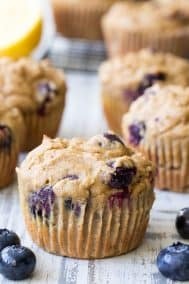 I made mine as muffins without frosting they were perfect in the morning! Cupcakes are delicious!! …. but holy buttercream frosting fail for me :(… I used exactly what the ingredient list said, so I’m not sure what happened…. it tastes good, but it just clumped up mostly, so never got to the spreadable state…. maybe I don’t have the right kind of hand mixer? Oh I’m so sorry about that, not sure! Something must have separated, I wonder if you could chill and remix? 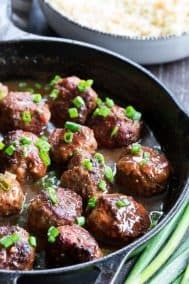 These look amazing and I can’t wait to make them!! Do they freeze okay (without the frosting)? If not how best to store them please?